Dusty sped us into Lincoln on Thursday night, arriving shortly before the witching hour. 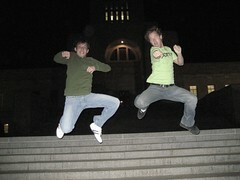 We got our jump on at the capitol, then looked for a place to stay. Dusty is a good Nebraska guy, he's even getting married in a few months and starting up his own software business. Not bad Dusty, not bad. Joe called us up as we were coming into town and offered a place to stay. Joe has a sweet new house in the Lincoln suburbs, and offered up some rooms for us. He works as a local carpenter and wanted to have us over. He even hooked us up with food before we left in the morning. Tom had arranged to pick us up Friday morning at Joe's house. He took a couple hours off work from the hospital to take us out of town. Tom let us off in York one hour outside of Lincoln, with about eight more hours of corn fields before Cheyenne or Denver. We got going on the side of the highway and waited, and waited, and waited. Then we waited a couple more hours. This gave us time to think back to Day One when Ed from Massachusetts sang us the Nebraska fight song. We even had a sign saying "Colorad", the O didn't fit, but got nobody. We did watch all the college kids with Colorado plates drive home for Thanksgiving though. Finally after waiting on a cold, windy on-ramp Armando pulled over. Armando speaks very little English, and we speak very little Spanish. In fact, we highly doubt he will ever see this web site. We tried to tell him about it, but there's no way he knew what we were talking about. He just responded with a friendly smile and laugh. Armando was our second non-English speaking driver, but he was the first driver to frisk us. It wasn't even at the beginning of the ride, after driving a half hour or so, he asked us to pull over (Scotty was driving), got us out of the car and frisked us. He patted us down as the construction workers beside us looked on puzzled. He seemed pleased with our lack of weapons, so we got back in the car and continued west. So, why was Scotty driving? We don't really know, he wanted one of us to drive, and we needed to make up some lost time, so off we go. Armando was a really nice guy, but we don't really know what his full story is. Couldn't find out what he's doing in Nebraska, what he likes to do, or why he drove us here to Ogallala, in western Nebraska. Either way, we parted ways with big high-fives while he shouted "Amigos!" If you're gonna pull a Scotty and Fiddy and hitch-hike around the USA, you may wish to go online and find people to help you first. Conducting a people search has never been easier. Need to do a background check before climbing into that van? Relax. Our site has a comprehensive database to ensure your trip is a safe one. Happy trails! On Wednesday night Andy elevated his status from awesome to legendary. Without even thinking about it, Andy agreed to drive us all the way to Boulder, Colorado. Remember he came out of surgery a few hours ago. But here’s the catch: Andy didn’t have his car, and Matt needed to drive back to Springfield. So, Andy got on the phone, called around looking for a car to drive over 1000 miles west. One prospect fell through, then another and the chances weren’t looking good. In comes Casey to save the day. Casey drove a couple hours up to Walcott, Iowa to pick up Matt and take him back to Springfield. So, Matt left his car with us to drive to Boulder, Colorado and back. Don’t worry, we’ll go to the capitol in Denver too. Andy may just be the nicest guy around, or at least in the western hemisphere. He works for his local church helping kids as a youth minister. He is an easy going guy who has no problem sacrificing the pain of recent surgery to drive some strangers a couple states over. 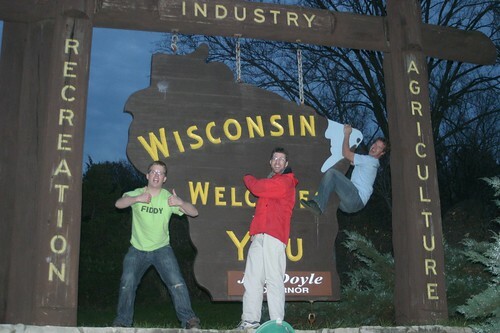 So we spent Wednesday night at the I-80 truck stop and got going the next morning. And by morning I mean 3:00 PM. That’s just how we roll. The drive through Iowa was exhilarating and unbelievable. Flat, empty fields, mixed with thin, leaf less trees, and billboards. 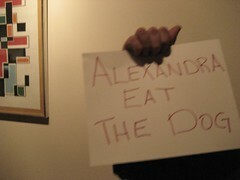 Don't forget the billboards. 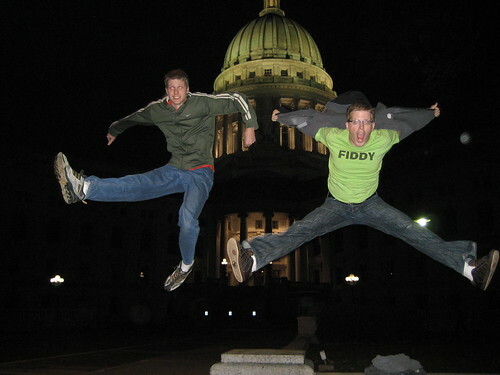 Andy made the arrival at the capitol building more exciting by jumping curbs and taking the governor’s parking spot. There to meet us was Julia, Heather and their families. 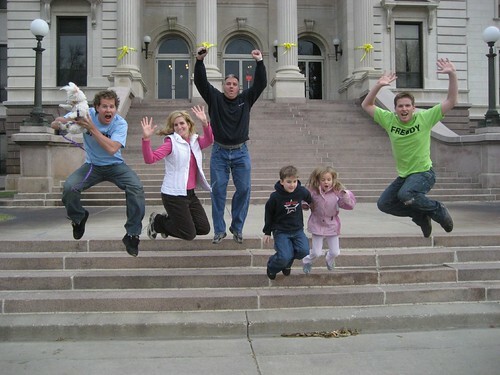 They were all excited to see us and get in on some group jump shots. 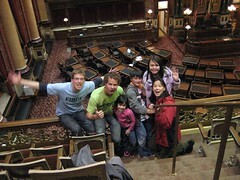 We met a senator and he invited us into the big political speaking room to have a look. It was interesting, but getting photos was way more fun than anything else. We were gonna stay longer, but he asked us if we wanted to attend a gubernatorial. That was the most awkward word we ever heard so we left and went outside for some more photos. We said goodbye to out capitol guests and continued west. In the town of Council Bluffs disaster struck. Andy got a call from work, they needed him there, so he called off Colorado and planned to head back towards Springfield. Oh well, duty calls. It worked out well, as Dusty had just called to offer a ride from Omaha, Nebraska to Lincoln. So we met up with Dusty, said goodbye and thanks to Andy, then kept heading west. Controlling your Iowa credit card debt can be tough with the way that today’s economy is. Many people have problems with Cedar Rapids credit card debt and don’t know what to do about it. 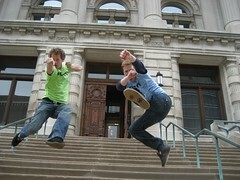 Getting out of Des Moines credit card debt can get you back on track with your life. Take control of your finances and control your debt, don’t let it control you. If any person has a puppet show, wire dancing or tumbling act in the state of Indiana and receives money for it, they will be fined $3 under the Act to Prevent Certain Immoral Practices. We have no idea what wire dancing is and tumbling just doesn't sound safe. But a puppet show? We couldn't resist. And what better time to do a puppet show then on live radio? But fear not, we're not fugitives on the run in Indiana. We managed to get pardoned from a Judge in the court of appeals for breaking this law. Matt and Andy saw us coming into Springfield this afternoon and acted quickly to set us up with a ride. The two Springfield residents gave us a call and offered a ride to Iowa. So in Springfield the Aussie boys passed us off to Matt, Andy and their Buick. It would be hard to match the fun of the previous ride, but we didn’t know what was in store for us. Matt and Andy turned out to be the perfect people to meet. They are both on their way to all 50 states as well, with 48 done they have only Alaska and Hawaii to go. Matt even promised not to cut his hair until he goes to number 50. While working towards this goal they put about 25,000 miles on the Buick since March, combined with working full-time and going to school. Andy gets the “sucking it up and bringing it” award. He had surgery on Wednesday morning to repair some damaged tendons in his right arm. Instead of resting or recuperating, Andy joined us for the trip. Not to forget about Matt, he blew off working on a project and studying for a test on Thursday. Both guys are all about spontaneous road trips. They’ve been known to drive a couple thousand miles to try a burger in Pennsylvania, go without warning to the beach in Florida and double on a Honda Goldwing to the Harley Davidson rally in Sturgis, South Dakota. 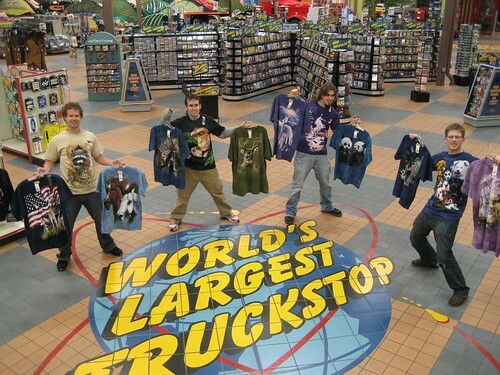 They took us up to the world’s biggest truck stop on I -80 in Iowa. You must see this area to fully understand. We arrived at night, so it was hundreds, if not thousands of rigs lined up far into the distance, all idling for the whole night. The building is better described as an interstate castle; it has different levels, branches and rooms stretching in every way. They sold everything inside from food to dolls to a mace. Who buys a mace at a truck stop? Or better yet one of these? Out of all the stuff being sold the shirts below were the best. Don’t just look at this photo, open it up and carefully examine it to get the true meaning of the garments. We asked the big, intimidating trucker took the photo for us what his favorite one was. None of us saw it coming when he chose the purple unicorn one Matt is wearing. We were looking for a Basset Hound shirt for Matt, but unfortunately they didn’t have one. You see, Matt, like Scotty is a Basset enthusiast. Matt even owns a Basset named Norman. Norman is from Alaska, and has record breaking ears. Well, fortunately Scotty had a Basset Hound shirt with him, and passed it on to a fellow Basset lover. Remember the other day in Illinois how we challenged Alexandra to eat a hot dog on stage during her routine at the Fitness Hollywood event this weekend in Los Angeles? Well, she does her fitness routine tomorrow, and we just got word from somebody who'll be in the audience that they're gonna video tape the whole thing. Come back tomorrow to see if she scores herself a free flight to state 50! Don met us at The Slippery Noodle for lunch and agreed to take us north to Chicago. Don lives in Lebanon, just north of Indianapolis. He took the day off work and met up with us to hang out and go for a drive. A friendly family man, Don got set up in his dad’s car for the day. It even had sheep skin seat covers. Don took us in downtown Chicago and right to the capitol building. Number 41 done. Nah, just kidding we know it’s not the capitol. Don left us downtown to check out the city and figure out what to do next. 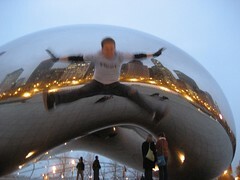 All of Chicago is really cool, but the best part is “The Bean”. 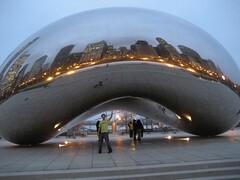 The Bean is an oversized chrome coffee bean on the edge of Lake Michigan. These photos show how cool it is. Julia gave us a call around five and offered a place to stay and entertainment for the night. We quickly met up with her and went to the Chicago Museum of Modern Art. 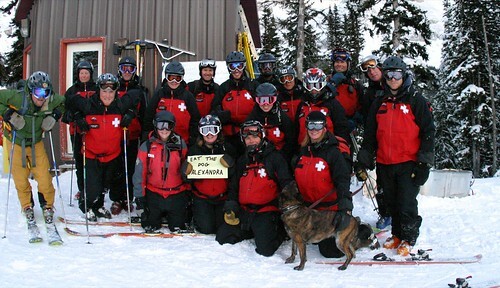 Julia is in town on business from Canmore, Alberta, Canada. She’s staying at a friend’s apartment on the 27 floor of a building in downtown Chicago, and offered us some couches for the night. Julia, or Jules, invited us to a work party in Chicago last month, and it randomly worked out she was back in Chicago again this week. She’s a super cool, laid back girl who retired from the life of a ski bum, and entered the white-collar world. Well kinda, she still lives in a ski town and skis more than me or you. I think she’s still a ski bum at heart. The company she works for, was getting about 20 people together to check out the sustainable design exhibit, then having a wine and cheese party. The museum was awesome, all the new designs and exhibits were amazing to see. 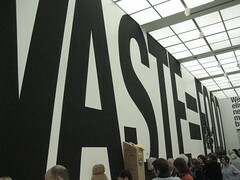 You may have heard the trendy catch phrase “Waste equals food”, well this exhibit proved that statement. 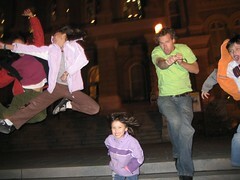 Before leaving we got the record for group jump shots. 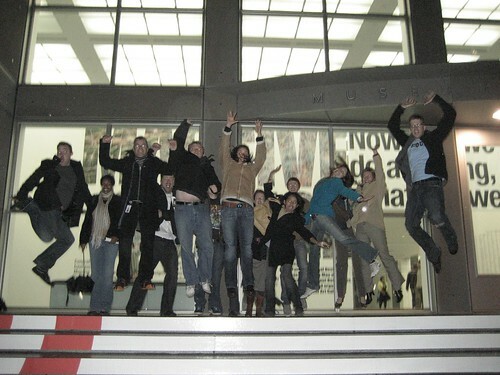 Here’s 14 staff members of Critical Mass jumpin’ it up. Geoffery (third from the left) had us all back to his swanky urban apartment for wine and dinner. It’s a strange feeling sitting in this amazing downtown apartment, surrounded by lots of awesome people, when only two hours before we had no idea what we were doing for the night. Everyone there decided we needed to generate some content for the web site. We wanted everyone to make a hitchhiking sign that shows where they would want to hitch to. 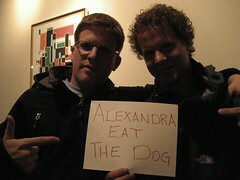 After the party a group of us went out in Chicago and spread the word about Alexandra’s hot dog challenge. After a fun night with awesome people we crashed on the couches at Julia’s apartment. Alexandra picked us up in Madison and we headed south to Illinois. 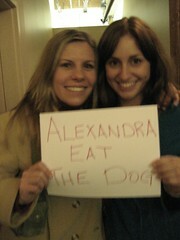 Alexandra is originally from Byron, Illinois, but has been living in LA for the past few years. She is into competitive fitness routines; kinda a mix between bodybuilding and a beauty pageant. She’s actually on her way to LA today to enter a competition on Friday. Now, here’s where you can help. 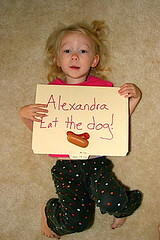 We challenged Alexandra to eat a hot dog on stage. If she does it, and does it well, we’ll fly her to State 50. So we need you to email her through her web site and encourage her to chow down on stage. C’mon it’ll only take a second. We’re not joking either. 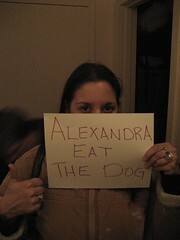 Alexandra is one of those happy-go-lucky kind people. She gets excited when she drives through highway tolls, because she gets to pay for herself, and the person behind her. We had a good time riding with her in her Saturn to her parent’s restaurant in Byron, Illinois. Randy, her step dad treated us to lunch. We didn’t get a chance to do our workout routine, but maybe in state 50. Stacy came to meet us at the restaurant and took us south towards Chicago. She blew off work for the day to drive us into Michigan. 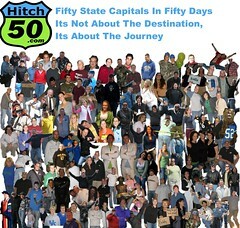 Along the way we stopped to get a new Hitch50 symbol. 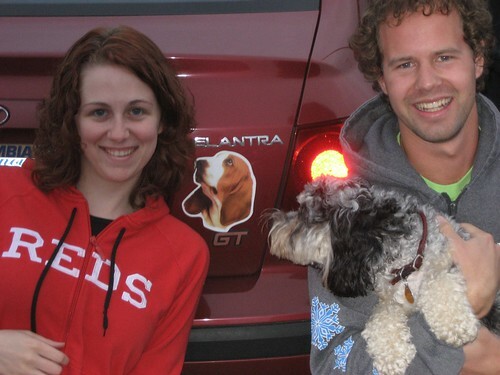 This hound now appears on the bumper of any car we’re in. Watch for it on an interstate near you! Stacy lives in the Chicago area, and wants to go to law school. Check out her web site to see how you can help her achieve her goal. Stacy and her dog Madison took us to Kalamazoo. I knew we we’re officially in Michigan when a pickup rolled into the gas station blaring Eminem and a scrawny white guy got out of his Sunfire, adorned with bleach blond hair and proceeded to stare me down. We know Michigan isn’t all like this, but pop culture leads us to this image. We said goodbye to Stacy and met up with Kahn. Kahn drove out from Detroit to take us to Lansing. Kahn is a cool guy who loves his four kids and steak. He originally planned to take his whole family and us on a family road trip, but unfortunately the timing didn’t work out. Oh well, next time. 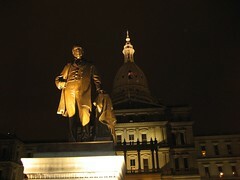 He took us for a quick visit in Lansing Monday night. 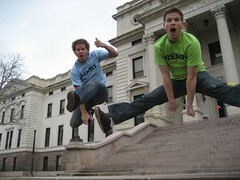 After a short photo shoot, at the capitol we were on the road again heading south. We've been getting all kinds of emails asking about some guys named Sammy and Freddy. There must be some confusion, we are Scotty and Fiddy, not Sammy and Freddy. Are you good at Photoshop? Or any other Photoshop type programs? Or bad at them and want something to do? Well here’s your chance. 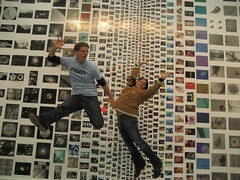 We want you to take any of our photos and do something cool with them. 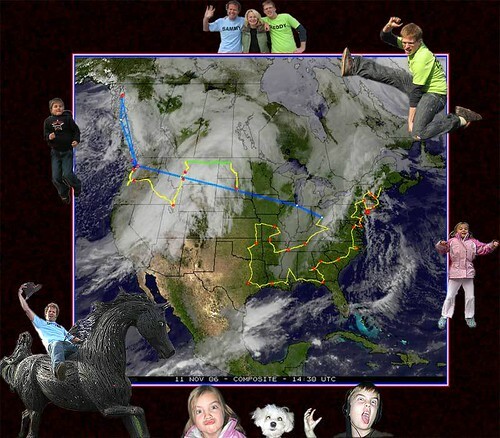 Make a collage, put yourself in them, change it into ascii art or anything else. 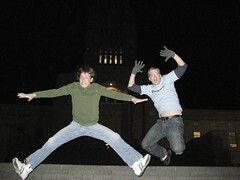 Potential good themes may be hitchhiking, USA, road trips, jump shots, awesome people or people doing the Paul Mancell. Or better yet come up with a totally random theme and send it in to us. 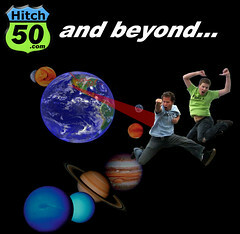 We’ll post all the entires, but the three best get limited edition customized Hitch 50 shirts. Winners are announced on December 1st, so what are you waiting for? Get all of our photos here, download them and get photoshoppin’ Download our logo here. PS. Bill in Washington, DC is off to a big head start. We slept at Brad’s place Saturday night and he offered to take us into St. Paul Sunday morning. 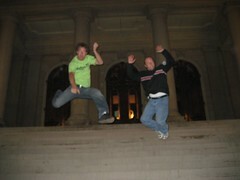 But, Jason, also from Sioux Falls also wanted to take us into St. Paul. Luckily Brad had already handled the situation by calling Jason and combining their efforts to get us there together. To make it even easier, they live only a couple block away from each other, but never knew it. The four of us piled into Jason’s Jetta and headed east to Minnesota. 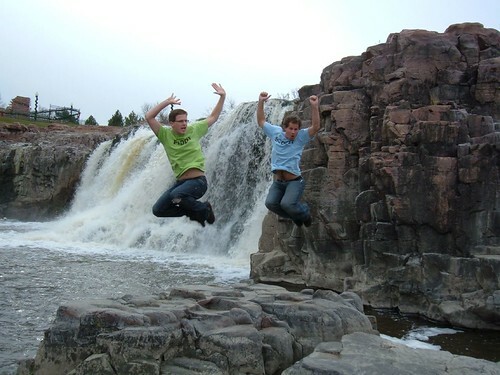 Before leaving town we checked out the falls of Sioux Falls. The area was recently restored and made into a really nice park. Don't believe us? Have a look. Jason served in the Navy and has some crazy stories about working on the submarines, like staying submerged for 72 days, running into whales and a hatred for dolphins. Brad is on a quest to prove to us that South Dakota is cool, and it’s working. You can read about it all here. We consider ourselves professionals, but not yet experts in the hitchhiking field. The expert title comes with years of practice, concentration and diligence. It was our good fortune we met a true expert in St. Paul. 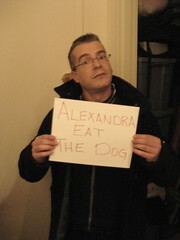 Roger Johnson is “The world’s first self proclaimed welcome sign photography expert”. 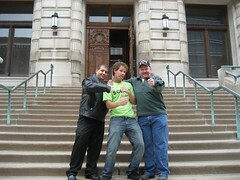 Roger, a St. Paul local, agreed to meet us at the capitol building with his twin brother Rodney and Haley Chamberlain. Never heard of her? Well you better check this out. 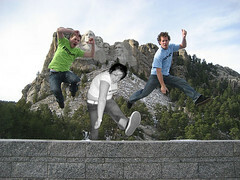 The three of them are planning a 50 states in 50 days trip for the spring and have been following our progress. You can follow their progress here. They are filming weekly updates leading up to their big trip and invited us to join along this week. 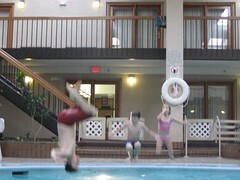 The video is posted below. But wait, keep reading and watch it after. The capitol events continued with Nick’s Great Dane, Tango. Nick, a St. Paul local hooked us up with train tickets from Montana to North Dakota through his travel agency Leisure Travel. Then we got to hang out with Paul from the local TV station WCCO. 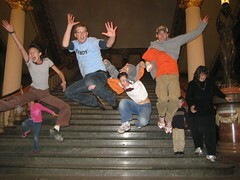 Just when you think it couldn’t get any better out came the Minnesota tradition of the capitol building stairs three-legged race. 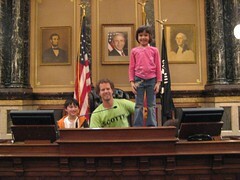 Scotty and Fiddy were in tough competition against Roger and Haley, two seasoned veterans. The wind was gusting from the east, the stairs were freshly polished and the crowd anxiously awaited the starting gun. Some say it was the weather, while others say we were road weary, but frankly we were just out of our league. Crissy drove 200 miles to Pierre on Saturday morning to help us out with rides. While we were all pretty excited about the craft fair going on in the hotel, but we pried ourselves away and hit the road. 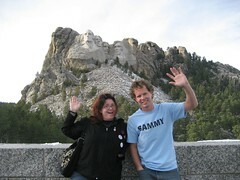 She gave us two options for the day: Go east to Sioux Falls, or go west back to Rapid City and check out Mt. Rushmore. Easy question. No American road trip would be complete without a trip to Mt. Rushmore, so we headed west. 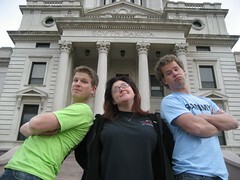 Crissy is a radio DJ at HOT 93.1 in Rapid City, SD. She put her kids, husband and concert plans on hold to hang out with us on Saturday. Her radio DJ personality comes through right away. The clever, quick wit morning DJs possess was obvious when the first sentence she said to us was “craft fair! Sweet”. On the drive back to Rapid City we stopped in at the famous Wall Drug for some famous free ice water. Wall Drug is one of those tourist traps, which stays alive because of the hundreds of billboards littered throughout the surrounding highways. After seeing the tacky ads for hours it would be almost criminal to pass by without having a look around. We did have a look around and even spent some money. Freddy got a new belt buckle, while Sammy got a new hat. Crissy took us by her radio station to have a look around and meet her husband Adrian. Like many radio DJs he does not go by Adrian on the air, rather working for two stations under two different ‘on air names’. 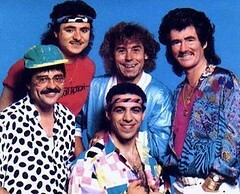 Those clever DJs, I always thought radio just attracted the cool named people, but it’s all a front. Later Crissy and her Pontiac took us into the Black Hills to see Mt. Rushmore. It’s definitely one of those attractions you need to see to understand. But hopefully these sweet photos will do some justice. After Mt. Rushmore Crissy elevated her status to a true "Drive-A-Saurus-Rex". She offered to drive us all they way to Mitchell, about 300 miles away. We arranged a ride to come meet us a little bit closer in Chamberlain, but it’s still a long way. Crissy’s distance for they day ended up being over 860 miles. That’s good for top-three in the long distance ride category. Thank you for being such a road warrior Crissy, we appreciate it. Brad came to meet us at Al’s Oasis in Chamberlain. Al’s Oasis is yet another South Dakota highway tourist trap; full of tacky and useless merchandise, like this. As nice as South Dakota is, it seems like their economy is reliant on tourist traps like Al’s Oasis, Wall Drug, drive through zoos, forests full of all the American president’s statues, the ‘original’ General Lee and some mountain with guys heads on it. I guess that’s just another reason why South Dakota is cool.